We are so excited to announce the first ever Hebrew Bible that was designed to run natively on Kindle! Thousands of copies sold since 2014! The Hebrew Scriptures with 1917 Jewish Publication Society English Translation with Hebrew Bible priority (buy on Amazon). 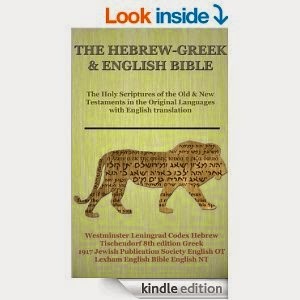 The Hebrew-Greek & English Bible: Holy Scriptures of the Old & New Testaments in the Original Languages with English Translation with Hebrew/Greek priority, including Hebrew Old Testament and Tischendorf 8th ed. Greek New Testament plus English translations (buy on Amazon). The Hebrew Tanak: Hebrew Bible Edition with Hebrew Bible priority and no English translation included (buy on Amazon). All 39 books of the Tanak (Torah, Nevi’im, Ketuvim) [Genesis through 2 Chronicles] in Hebrew. Crisp, beautiful, large Hebrew characters that can be resized smaller or larger, as needed. Hebrew text has all vowels and cantillation marks (accents). Designed primarily for Hebrew Bible-priority usage (except for The Hebrew Bible: Jewish Publication Society 1917 Translation with Hebrew Text Supplement which is English Bible-priority). Easy click-through navigation to other books and chapters by clicking on any chapter name to return to the Table of Contents. Hebrew text from the Codex Leningradensis (digitized through the Westminster Leningrad Codex Tanach). All 27 books of the New Testament [Matthew through Revelation] in Greek. Crisp, beautiful, large Hebrew and Greek characters that can be resized smaller or larger, as needed. Hebrew and Greek texts have all vowels and cantillation marks (accents). 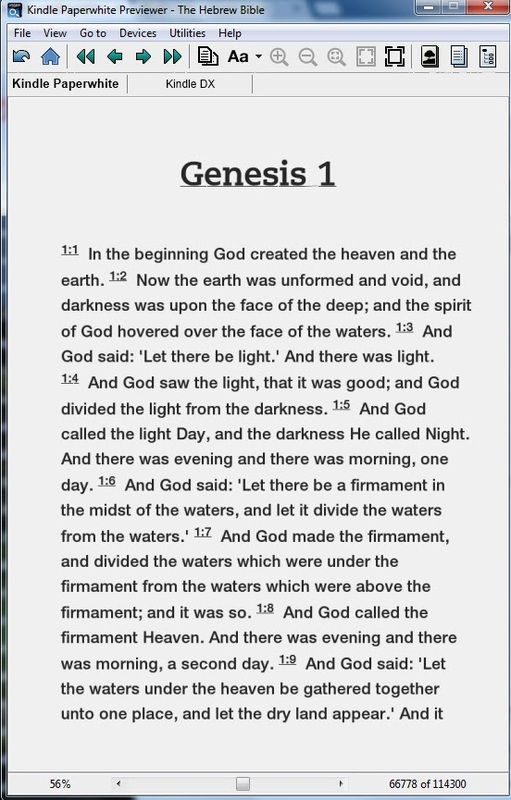 Quickly access the 1917 Jewish Publication Society English translation of the Old Testament (included) as an English translation reference for difficult-to-translate Hebrew verses with a few simple clicks within the Hebrew text by clicking any chapter-verse reference within the text or reference the Lexham English Bible English translation of the New Testament for the Greek New Testament verses. Designed primarily for Hebrew and Greek Bible-priority usage. Unicode Hebrew and Greek characters. Tested and working beautifully on the 4th generation Kindle e-Ink series, running Kindle software version 4.1.1, and on Kindle Fire HDX. Users report success on 2nd gen. Paperwhite also. Note: Hebrew and Greek fonts DO NOT DISPLAY CORRECTLY ON OLDER E-INK KINDLE DEVICES (1st, 2nd, and possibly 3rd generation e-Ink Kindles). This is due to the older devices' inherent limitations in displaying complex language fonts like Hebrew and Greek. This cannot be corrected unless you can update your Kindle to software version 4.1.1+. Do NOT buy these titles if you have an older Kindle, because they will NOT display the Greek/Hebrew fonts correctly. Download a free sample before you buy to test if it will work on your device. How the Hebrew Text appears on 4th generation Kindle e-Ink device. How the JPS English appears after clicking chapter-verse reference in the Hebrew text. 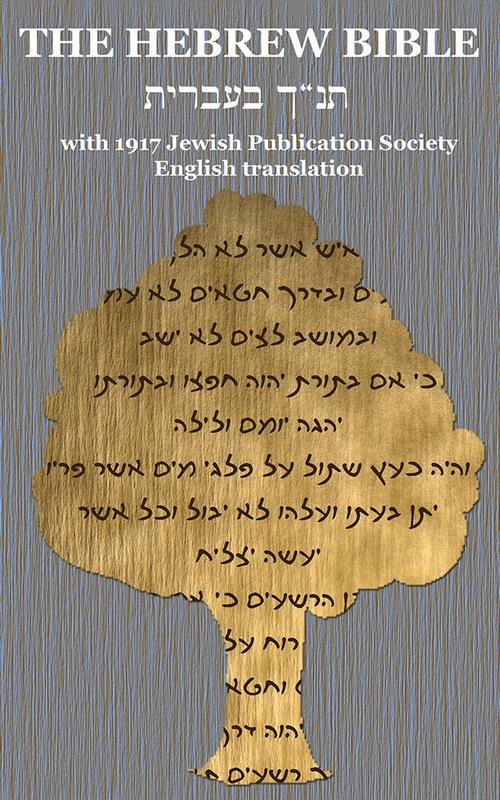 You can download a free sample of The Hebrew Bible: Jewish Publication Society 1917 Translation with Hebrew Text Supplement to test how well it works on your Kindle. Download the free sample from Google Drive to test on your device. Use this to test The Hebrew Tanak as well (though Tanak does not include the English translation). You can download a free sample of The Hebrew-Greek & English Bible to test how well it works on your Kindle. Download the free sample from Google Drive to test on your device. Instructions: Copy/paste the file onto your Kindle using the supplied USB cord. See your Kindle's instruction manual for help on manually loading files. You should also be able to use Amazon's free Send-to-Kindle service to deliver the sample to your Kindle through their Whispernet service over your WiFi or 3G connection. The Hebrew Bible: Hebrew Scriptures with 1917 Jewish Publication Society English Translation is $5.69 from Amazon. 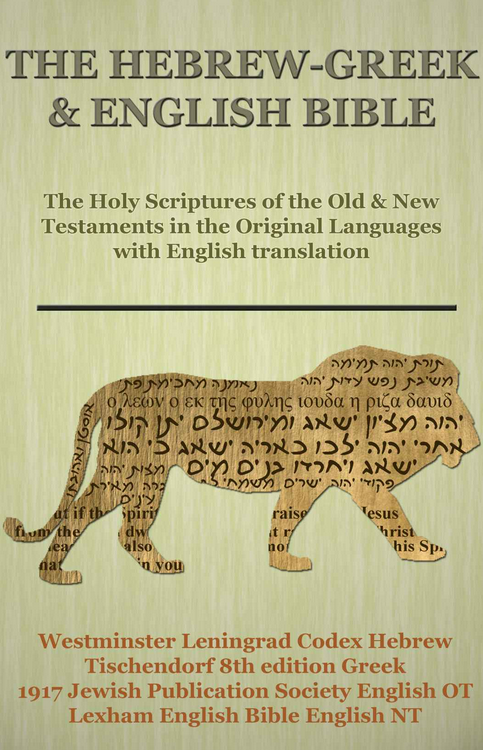 The Hebrew-Greek & English Bible: Holy Scriptures of the Old & New Testaments in the Original Languages with English Translation is $6.99 from Amazon. The Hebrew Tanak: Hebrew Bible Edition is $4.29 from Amazon. Download a Free Sample to test how our ebooks work on your device before you buy! Contact us for support on your book order on our Google Form here. 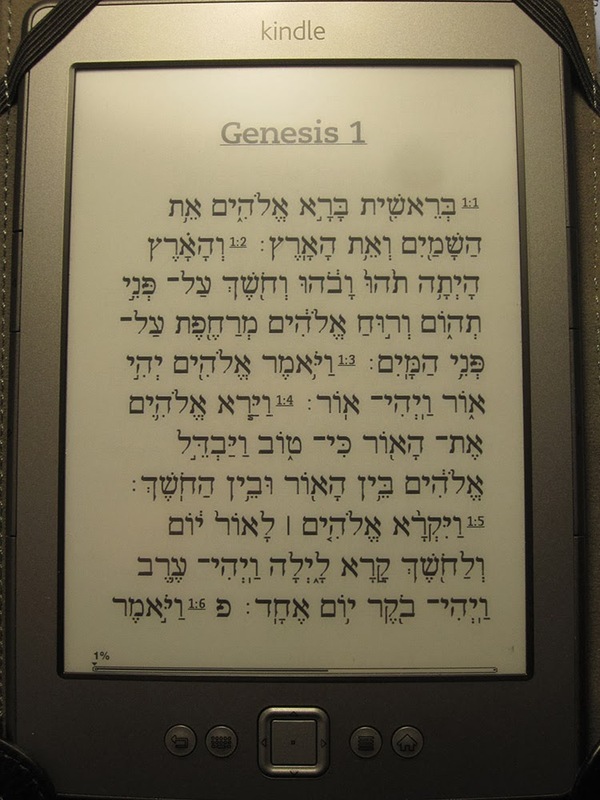 Due to Kindle's inherent right-to-left language limitations, the Hebrew text is not searchable, and currently you are not able to highlight and clip verses from the Hebrew text (at least on the e-Ink series). The Hebrew Holdem-Vaser character does not display exactly as intended on any Kindle that we've tried with the default Hebrew font. The difference is negligible for most users. Please leave feedback about these titles in the comments below, and please leave constructive feedback on Amazon if these works benefit you.